Wherever you are, Sebastian Tomczak from South Australia, aka Little Scale, is a sound artist you really don’t want to miss. For a long list of awesome, look no further than his blog, for Game Boys tuned like Japanese kotos, Max patch sequencers to download, and Game Boy Advance albums. He’s promised to bring his performance-ready Sega MegaDrive and Atari 2600 jr, a 2600 MIDI interface, and the Sega sounds controlled by new tech, the Novation Launchpad, as pictured in the video at top. Babycastles teams up with Handmade Music Night for the inaugural opening of a permanent indie games arcade in Brooklyn. This opening celebrates Adam Atomic’s Canabalt (NYC), Ivan Safrin’s Owl Country (NYC), Tristan Perich’s KillJet (NYC), and Kyle Purver’s Jottobots (NY), which will be playable all night and throughout December. Cardboard lectures by the game developers! High Score Chalkboard Dress by Lara Grant! Chiptunes performance and workshop by little-scale (AU)! Show up extra early for a secret chipmusic toy soldering workshop by the Loud Objects. Part of an official Blip Festival Pre-Party – 10% discount on Blip Festival tickets available, and a group hug ride to the Tank afterwards! Babycastles, New York’s first independent games arcade, is named after bite-size portugese cakes in Japan. 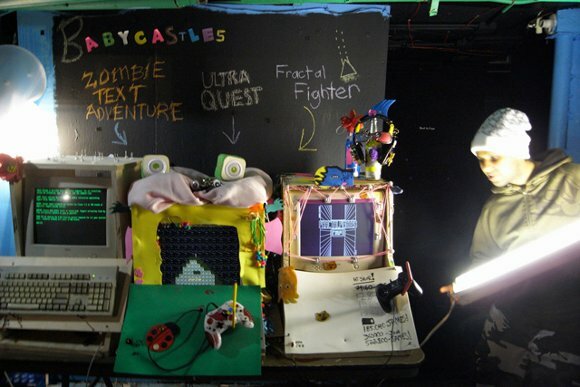 As a new function of a legendary all-ages venue for Brooklyn music and other local diy-culture, Babycastles is a wall of six lovingly decorated arcade cabinets that offers a physical place to play games made by amateur and independent game developers. The arcade is open four or five nights a week, during every show at the Silent Barn. The venue throws an opening party every few weeks for a new collection of arcade games, with the game developers present, music, drinks, and plenty of opportunity to get together and love games. Part party, part mixer, part Science Fair, and part performance, this is an informal chance for geeksters and the geek-curious to come together, relax, and discover new sounds. The evening is a gathering of inventors of new instruments & music technology. Featuring circuit-bent toys, custom software and patches, interactive digital & visual instruments, custom electronics, electricity-powered noisemakers, DIY robots and new acoustic instruments. And it’s open to everyone from hard-core hackers & newcomers to music lovers who want to learn about the DIY music scene.